Address: Budapest in the Pest side, 7th distr. Akácfa street. Close to Blaha Lujza square. Living space: 70 square meters. Rooms: 2 separate room + kitchen, bathroom. Amenities: This very nice apartment is in a new building next to Blaha Lujza square. The comfortable apartment has a room with a double bed and a sofa (can be opened) with satellite TV and big windows to Akácfa street, a well equipped kitchen and a nice bathroom with bath tube. We offer tourist information desk, reception and luggage store. Bed sheets, towels would be provided for you. Free maps are included. Price: The rates are quoted per apartment and night and include all utilities (gas, heating, water and electricity), linens, towels, kitchen appliances, taxes. Apartments are subject to availability. Check-in time is 13 p.m. Check-out time is 10 a.m.
Payment: Only cash payment upon arrival. 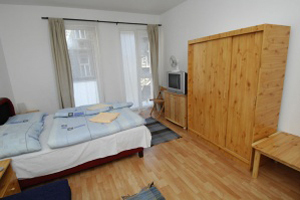 Location: The apartment is centrally located in the Pest side of the city on the Grand Boulevard. There is the red metro stop (Blaha Lujza tér) 100 meters and the main tram lines (number 4 and 6) and bus lines (nr. 7, 78) stop on the square, 10 minutes from Synagogue, 5 minutes from New York Café and nearest entertainment zone and shopping street. -Public transportation: Ferihegy International Airport: Reptér (Airport) bus to Köbánya-Kispest -> Metro3 (blue line) to Ferenc korut -> take tram NR.4 or 6 direction Moszkva square and to get off in Blaha Lujza square and walk 200 meters.